New Wave Domesticity: sweet and savory grilling! grilled asparagus and peaches. sweet and savory grilling! grilled asparagus and peaches. it's officially summer in portand. i don't care that the sostice is not until late june. the sun is shining, i have sunburn, and everything feels like summer, so it's summer! i've been busy trying to take care of things around the house before i get to caught up in the summertime. this much needed 3-day memorial day was spent going to yard sales and cleaning house mostly, but we also made a lovely dinner on our tiny grill. here are two super simple grill recipes we used yesterday and they both turned out wonderfully. if you do not have a grill, these would be great in the oven as well. you would just want to cook them at about 400 degrees and check in on them every few minutes since they are both fast cookers. combine marinade ingredients in a jar and shake. trim & wash your asparagus and the skewer through the thick part of the stem (you don't need to use a skewer, but it just makes it a lot easier to flip them and make sure they don't fall into the grill). i put about 10 spears per skewer and that seemed ideal. lay asparagus skewers on aluminum foil (a little more than twice the length of the asparagus - about the length of a cookie sheet) pour half the marinade onto the first skewer. flip and make sure all the spears are coated. wrap the foil around the asparagus and refrigerate for about 30-60 minutes before grilling. 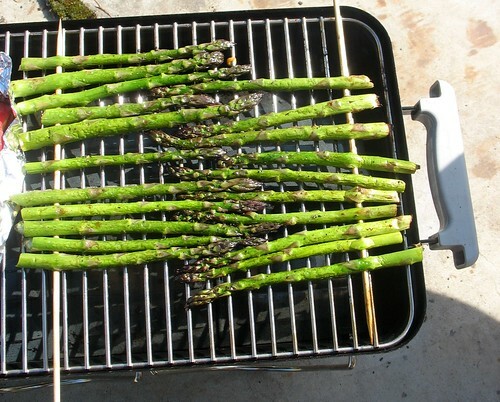 grill each side for about 3-5 minutes until the asparagus gets tender. wash and cut the peaches in half or quarters. remove the pits. in a small bowl, mix sugar, cinnamon, almond extract, and vanilla. rub this mixture onto the peaches and coat on all sides. put the peaches on a piece of aluminum foil cut side down and curl up the sides a bit to avoid sugary syrup dripping all over your grill. 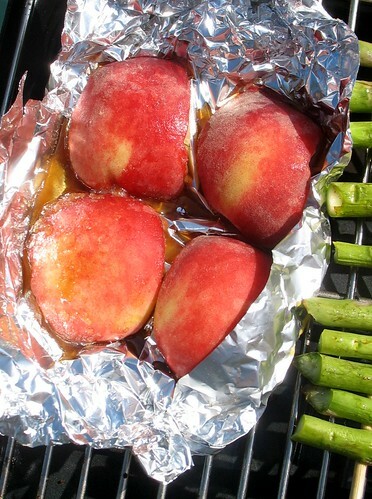 put the foil and peaches on to the grill and allow to cook covered for about 3-4 minutes until the sugar melts and starts to caramelize. using tongs, remove the peaches from the foil and place directly on the grill for about 4-5 more minutes until desired tenderness. they turned out amazing! so easy, nothing too fancy involved, but they are just such a lovely treat for a cookout! 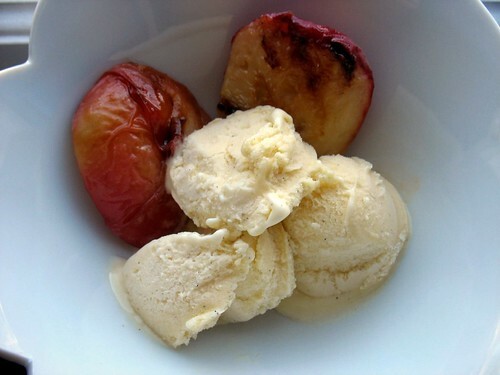 you can eat these right off the grill, but i thought they were especially good with some ice cream on top!